For this itinerary, Air France takes 6h40 while Delta takes 7h04. Why don't they have the same travel duration? Is it typically due to the type of airplane, the route, or something else? Assuming they are not code sharing the identical flight :-). While I have flown frequently in recent years, the following are "common sense" conjectures, not information based on knowledge of the deep inner workings of the system - as will be obvious when you read them. Delta may be more honest or realistic than Air France. Pilots quite frequently announce "we are eg 15 minutes earlier / later than expected due to ...". Usually head or tail winds. The mean or the median or the 3rd quartile or ... trip times may all be valid figures to use. The two airlines may use a different terminal at one or both ends with different taxi and processing times. An airline may choose to fly a less aggressive more fuel efficient flight profile. As boarding time is affected by actual departure time the airline MAY choose to alter projected departure times to manage passenger expectations. I had meant to add (honest :-) ), but forgot, and it was pointed out by others subsequently - aircraft capabilities may differ. Apparently, fastest by a nose, you'll get is ~+ 0.86 mach in a 747-400. That's probably air speed so ground speed will vary with altitude and wind speed. There are various cost/speed tradeoffs and some aircraft will reward their operators more with lower speeds. See list of claimed cruising speeds as a fraction of mach 1 at end of this post. They may have different security arrangements. For example, on some flights that I have taken, at some airports QANTAS have their own portable XRay machine and re XRay passengers luggage at the gate. You'd not expect this to affect shown transit time but it could depending how they determine these figures. These speeds are user supplied from a discussion here. This provides a short but useful comment on variation of mach 1 with altitude. The differing durations are a result of the aircraft that are used to fly the route by the two airlines. Delta uses a Boeing 757 aircraft while the Air Frances uses the slightly faster Boeing 747 and Boeing 777 aircraft on this route. Edit: My answer originally stated that the 757 was limited to 120 minute ETOPS (e.g. that it was required to stay within 120 minutes of a potential diversionary field.) However, according to Boeing, 757-200s (both RR and P&W engine configurations) were upgraded to 180 Minute ETOPS certification. I have updated the map below from gcmap to show areas where the 757 is allowed to fly under 180-minute ETOPS, which includes the entire North Atlantic. As such, the 757-200 is not limited on where it can fly between BOS and CDG by ETOPS regulations, so ETOPS shouldn't be a factor in why the Delta flight takes longer. edit: To add some explanation. 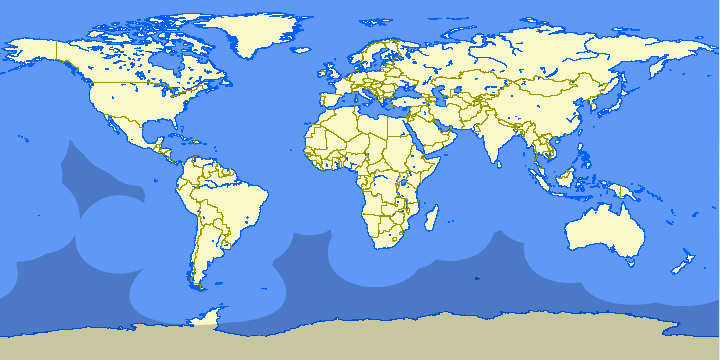 ETOPS (Extended range Twin Operations) is a rule which allows 2 engine planes to fly over oceans. Depending on how strongly the manufacturers promise that their engines are reliable the plane may be certified to fly routes where they are upto 120, 180, 330 minutes from the nearest airport. A flight from the USA to Europe wouldn't normally be very much longer even for 120min ETOPS. Different airlines will estimate different times based on their own data. As such, it is reasonable to expect a few minutes variation from one airline to the next. Large variations between flights at significantly different times of the day can also occur (even for the same airline). This is often due to the congestion of planes at peak times of day. I recall an article (that I can't find at the moment) that noted one airline had more than an hour of extra time for a particular route that arrived at a very busy airport. The same route earlier in the day didn't need the extra buffer. For the example you illustrated, the flights nearly overlap. However, the Delta flight leaves at 7:00 (a peak traffic time). It could easily be that the Delta flight is anticipating sitting in "heavy traffic" waiting to take off. Since departure times are based on the time leaving the gate and entering the queue to take off, this causes a longer flight. Likewise, 7:00 AM might be a higher traffic time than 8:00 AM for the arrival airport. I have observed within Europe, that some airlines tend to overestimate the duration that their flights take, for flights of 2:30 duration of around 10-12 minutes. This way, even if there's unexpected delay, the plane will still arrive on time. A pilot once told me that this has behavioral reasons. People don't mind being a bit late, but being a bit later than expected, that's the worst! Whether Delta does that, and to what extend they do this with long-distance flights, I am unaware of. Not the answer you're looking for? Browse other questions tagged air-travel airlines or ask your own question. How to find out which airlines have a MITA?